To Cite: Pahlavanhosseini H, Ayati Firoozabadi M, Hassanpour A, Akhavan Tafti M, Abbasi A, et al. Effects of Indomethacin and Meloxicam, Nonsteroidal Anti-inflammatory Drugs, on Tibia Fracture Union in Rats, J Orthop Spine Trauma. 2016 ; 2(4):e10701. doi: 10.5812/jost.10701. Background: One of the most important factors in the fracture healing is the intracellular production of prostaglandins by osteoblast cells. Nonsteroidal anti-inflammatory drugs (NSAIDs) exert their effects through inhibition of prostaglandin synthesis. NSAIDs are widely used in orthopedic practices and their effect on bone healing is not fully understood yet. Objectives: The current study aimed at examining the effects of indomethacin and meloxicam on tibia fracture union in rats. Methods: The current study was conducted on 60 male rats. Mid-shaft tibia fracture was induced in rats using bone-breaker device. The animals were randomly divided into 3 groups; a control group that received distilled water and 2 other groups that received indomethacin and meloxicam respectively for 28 days. At the end of weeks 1, 2, 4, 8 and 12, four rats were randomly sacrificed from each group, and histological evaluation, measurement of the calcium, phosphorus, and alkaline phosphatase plasma levels, as well as radiographic examinations were performed on them. Results: After 4 weeks, a thin layer of woven bone was observed in the vast spaces of the bone marrow in the fracture area in the control group. In the meloxicam group in the week 4, the formation of immature blades of bone was observed, which were less organized and more irregular. In the indomethacin group in the week 4, new bone formation was less immature and more areas of cartilage were still observed. In the radiographic evaluations, delayed union in indomethacin and meloxicam groups was observed, which was more significant in the indomethacin group. Conclusions: Indomethacin and meloxicam had impact on the process of bone repair and delayed union in both groups of drugs. This delayed union was more significant in non-selective NSAIDs (COX-I and = II inhibitors) rather than selective NSAIDs (COX-II inhibitor). Copyright © 2016, Journal of Orthopedic and Spine Trauma. This is an open-access article distributed under the terms of the Creative Commons Attribution-NonCommercial 4.0 International License (http://creativecommons.org/licenses/by-nc/4.0/) which permits copy and redistribute the material just in noncommercial usages, provided the original work is properly cited. Fracture healing is a complex process. Many molecular factors inside and outside the cells affect the quantity and duration of bone union (1, 2). Bone healing involves the interaction of osteoblasts and osteoclasts, which leads to the release of growth factors and cytokines, cell differentiation, and formation of new osteocytes (3). The effects of internal factors on stimulating osteogenesis and angiogenesis are accelerated (4). The main factor determining the fracture healing is the severity of the initial trauma and the amount of damaged soft tissue. Greater injury of the soft tissue reduces the amount of blood supply to the bone, and results in reduced repair process or even causes bone nonunion (5). Other factors could be involved in bone healing procedure, including malnutrition, alcohol, drugs, diabetes, taking certain medications, etc. (6). Bone healing in fractures has different stages: hematoma formation stage, the stage of soft callus formation, hard callus formation stage, and finally the re-forming stage. Of course, these stages overlap and cannot be distinguished separately (5). External factors such as elasticity of the bone at the fracture site affect bone healing and stimulate bone formation, accelerate cell growth, differentiation, chemotaxis, and synthesis of extracellular matrix (7). External chemical agents such as steroids, nonsteroidal anti-inflammatory drugs (NSAIDs), and chemotherapy also affect the process of bone repairing (8, 9). Bone repair is essentially an inflammatory process involving the synthesis of prostaglandins by osteoblast (10). Therefore, NSAIDs and selective inhibitors of cyclooxygenase (an enzyme that makes prostaglandins from arachidonic acid) can intervene in fracture healing (11, 12). But, in the latest systematic review in January 2011, in response to the question "Do NSAIDs inhibit bone union?” there was no clear answer and contradictory opinions were raised (13). Since NSAIDs are widely used in orthopedic practices and their effects on bone fractures healing are not fully understood, the current study aimed at examining the effects of indomethacin, a nonselective NSAID, and meloxicam, a selective NSAID, on fracture’s union of the tibia bone in rats. The current interventional and experimental trial was conducted on male rats weighing 200 to 250 gr. Rats were prepared from the laboratory of animals in Shahid Sadoughi University of Medical Sciences. Animals were kept under standard conditions, 12:12 hour light: dark cycle, temperature 22°C, and easy access to water and food. In the 1st step, animals were weighed separately, and then, they were anesthetized under a mixture of 100 mg/kg ketamine and 12 mg/kg 2% xylazine. Then, the right leg of the animals was disinfected. In order to stabilize the bone, internal fixation was done by axial pressure and rotation of an 18-gauge needle from the proximal of tibia tuberosity toward the medulla of tibia bone. The needle was placed in the intramedullary of bone as a closed intramedullary nail. Then, by a bone-breaking device, which structurally is similar to the devices causing brain damage in rodents, a closed fracture of tibia was created by making a direct hit on the leg of rats. The device consists of a tube, which is held vertically by clamps. The rat’s leg was placed in a prone position on a mattress of foam, under the lumen of the tube. Then, by dropping a weight of 650 gr, in the lumen of the tube from a distance of 15 cm, a closed fracture was applied in the middle 3rd of the tibia. This model of fracture and fracture fixation are simple because they do not need for opening the fracture site. 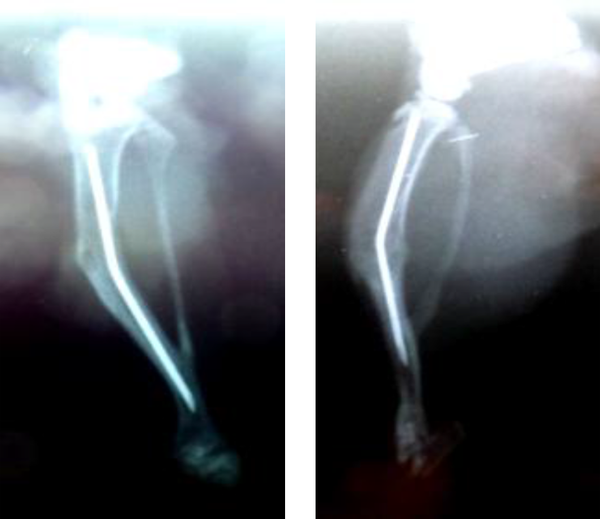 Then, biplane radiography was taken to evaluate the fracture and pin tibia. After this stage, the animals were transferred to a warm place in their cages and were observed until full recovery. When the numbers of animals with appropriate fracture, complete and isolated fracture of the tibia in the middle 3rd, reached 60, they were randomly divided into 3 groups of 20 rats. One control group that received distilled water, one indomethacin group and one meloxicam group, which received appropriate doses of drugs (1 mg/kg and 0.125 mg/kg, respectively) intraperitoneally for 28 days. Intraperitoneal administered doses were 10 mL/kg of body weight. At the beginning of each week, the animals were weighed again and the new administration dose and volume was calculated based on the new weight. To evaluate and assess the healing of the fracture and bone callus formation, at the end of the 1st, 2nd, 4th, 8th, and 12th weeks 12 animals were randomly selected (4 rats from each group). These rats were anesthetized. Biplane radiography was performed on the fractured bone and blindly evaluated by 2 orthopedists separately. They focused on the quantity of union according to the number of united cortices (2 cortices on anteroposterior and 2 on the lateral view). Then, to measure calcium, phosphorus, and alkaline phosphatase serum levels, blood samples were collected from heart. Finally, after cardiac perfusion with 0.9% normal saline and 4% paraformaldehyde buffer, using dental bore, right tibia fracture point plus half a centimeter from each side were separated. Bone samples were prepared and fixed in a fixative of 4% formaldehyde for 48 hours, and then, in 10% ethylenediaminetetraacetic acid (EDTA) at 4°C for 3 weeks. After tissue processing and decalcification, 5-µm thickness paraffin blocks were sectioned. Slides were prepared with hematoxylin and eosin staining (H and E), and then, studied for histological evidence blindly by a pathologist (14-16). In the histological evaluation, the kind of tissues, granulation, cartilage, bone (percent), cells, osteoblast, osteoclast (cells/ 10 microscopic fields), and thickness of callus and periosteum at the fracture site in millimeters were assessed. The results were transferred into SPSS software and statistical analysis was conducted to compare the groups by one-way ANOVA and the Mann-Whitney test. P < 0.05 was considered significant. In the histological review, the presence of neutrophilic exudates (neutrophil accumulation in a field of plasma-derived fibrin) was the main sign at the 1st week. This accumulation of neutrophils was significantly higher in the indomethacin group than the control and the meloxicam groups. The accumulation of neutrophils decreased in groups after the 1st week, but in the indomethacin group, the neutrophilic exudates were observed even in the 2nd week (P < 0.014) (Figure 1). In the process of healing, formation of granulation tissue (tissue-specific induced proliferation of fibroblasts and endothelial cells) had a declining trend until the 4th week. There was more delay in the absorption of granulation tissue in the meloxicam and the indomethacin groups until the end of the 2nd week (P < 0.001) (Figure 2). In the 4th week, the healing process advanced into the outstanding form of cartilage formation (scar tissue consisted of chondrocytes) and woven bone (the immature bone during fracture repair). There was a difference in the percentage of cartilage, in the 4th week, between the indomethacin group and the control and the meloxicam groups (P < 0.012) (Figure 3). In the 8th week of the healing process, there was a difference in the bone tissue repairing between the control group and the indomethacin and meloxicam groups (P < 0.014) (Figure 4). The percentage of immature bone in the control group, and the percentage of cartilage in the indomethacin group were slightly more than those of the other groups. The thickness of the callus was not significantly different among the study groups during the 4th, 8th, and 12th weeks. 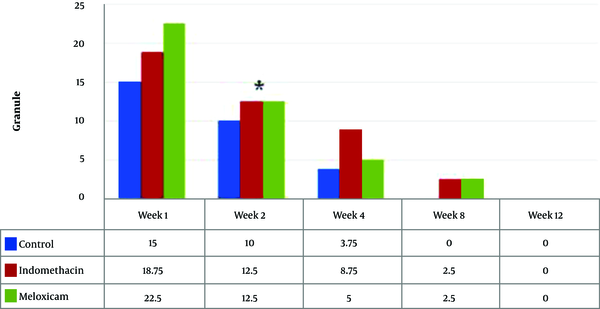 In the indomethacin and meloxicam groups, the thickness of the periosteum was slightly lower than that of the control group in the 8th and 12th weeks. This difference was more obvious in the indomethacin group (P < 0.003) (Figure 5). The number of osteoblasts increased in the 1st and 2nd weeks in the control group, and then, reached the minimum level in the 4th week, and then, raised compared with the other groups in the 8th and 12th weeks. The number of osteoclasts was higher in the 2nd and 4th weeks after the fracture than the other weeks. But, there was no significant difference in the number of osteoclasts among different groups (Table 1). Increased levels of serum alkaline phosphatase were observed in the 2nd week, and then, returned to the normal range. Alkaline phosphatase level in the control group, compared with those of the indomethacin and the meloxicam groups, did not significantly differ in different weeks. 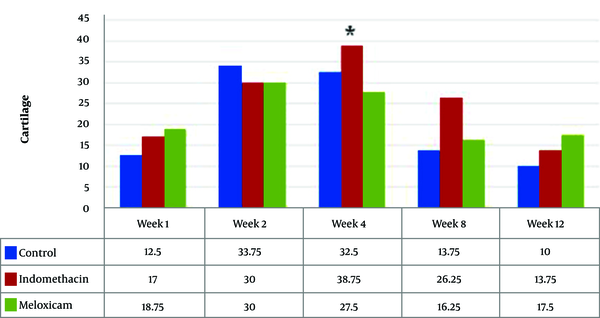 The serum calcium level was not significantly different among the groups except in the 4th week that lower levels of calcium were observed in the indomethacin group and higher level of calcium in the control group. The serum phosphorus level was not significantly different in different weeks among the studied groups. But, the serum phosphorus levels increased in the 2nd and 4th weeks, and then, retrieved to the lower levels in the 8th week (Table 1). Follow-up radiographies were evaluated in different weeks. No new bone formation was observed at the end of the 1st week in the rats of the 3 groups, but all of the rats in the control group, in the 4th week, showed 4 cortex/callus formations (Figure 6) .The average of cortex/callus formation in different groups and weeks in the anteroposterior and lateral views are shown in Table 1. The time factor was effective in the healing process of bone fractures (6). This result was obtained to evaluate the mechanical properties and the histopathology of fractures. In both cases, the effect of time factor on fracture healing was confirmed; in this case, whenever bone healing occurred faster, bone callus was more consistent and the probability of non-union or delayed union was less (17, 18). Histological evaluation results indicated that osteoblast cells were activated, which led to forming an irregular and immature bone. Eventually, immature bone was replaced by lamellar bone (intramembranous ossification) (19, 20). In the last research review by Rodeo et al., there were well documented reports that NSAIDs can inhibit fracture healing (21), but there were also articles that did not confirm such results (13). Initial examinations on the effects of NSAIDs on the process of fracture repair were conducted on laboratory animals. One of these randomized controlled trials on rats, by Allen et al., indicated that the effects of indomethacin and aspirin paid. The results indicated a dose-dependent response associated with delayed fracture healing in the group receiving indomethacin (22). After that, several other studies on animals demonstrated delayed bone healing (22-25). However, there were few studies on animals with contradictory results. More et al., by flunixin, a non-steroidal anti-inflammatory drug used in veterinary medicine, and piroxicam, examined the rabbit tibia fracture healing and reported that bone repair process was not significantly different, compared with the control group (25). Also, Huo et al., studied the effect of ibuprofen on hip fracture healing in rats during a 12-week study and reported no significant differences in biomedicine and histological tests, compared with the control group (26). In human studies on the effects of NSAIDs on bone repair, there were still many reports with controversies and disagreements. Giannoudis et al., in a study on 377 patients showed no significant improvement in majority of the patients who received NSAIDs (27). Adolphson et al., in a randomized double-blind trial on 42 postmenopausal females with bone fracture reported no significant difference in bone healing between the groups receiving piroxicam and placebo (28). In addition, some studies reported that different types of NSAIDs had different effects (28). Recent systematic reviews in response to the question “Do nonsteroidal anti-inflammatory drugs inhibit bone union?” had no clear answer; citation of many contradictory views in the context emphasized the need for further research (13, 22, 29). In the current study, conversion of connective tissue into the bone-building process in the extent and intensity was higher in the control group, compared to the meloxicam and indomethacin groups. In the control group, after 4 weeks, a thin layer of woven bone was formed in the vast spaces of the bone marrow. However, in the group receiving meloxicam, in the 4th week, the formation of immature bone blades was shorter, and smaller amount of newly formed bone in the defect was observed that were less organized and more irregular, compared with those of the control group. In the indomethacin group, in the 4th week, more areas of cartilage were still observed and bone centers were less immature. In the 4th week, the indomethacin group had lower levels of serum calcium and phosphor and higher levels of alkaline phosphatase than the control and meloxicam groups that might explain that in these weeks ineffective union processes still continued in the indomethacin group. According to the radiographic findings, 4 cortex/callus formations were observed in the control group at the 4th week, but this configuration happened in meloxicam in the 8th week; 4 cortex/callus formations did not develop in indomethacin group until the 12th week. According to these histological, biochemical, and radiographic findings, it seems that in the periods of indomethacin and meloxicam prescription, negative impacts and delayed unions were present in the process of bone repair that was more significant in the indomethacin receivers. But, after the secession of drugs in the final stages of bone healing in the 8th and 12th weeks, the union was similar in the meloxicam and control groups. In the 12 week in the meloxicam group, restoration was completed, but some recipients of the indomethacin group did not have perfect union yet. In spite of the fact that both selective and nonselective NSAIDs can cause delay union, this side effect was more significant in nonselective NSAIDs. Therefore, whenever it is necessary to prescribe NSAIDs to control pain in long bone fractures, selective NSAIDs such as meloxicam are preferred. Authors wish to thank animal laboratory staff of Shahid Sadoughi University, Mrs. Aghdas Mirjalili and Mr. Alireza Taymori, for their cooperation. Financial Disclosure: Authors declared no financial disclosure. Funding/Support: The current study was approved and financially supported by the Research Vice-Chancellor of Shahid Sadoughi University of Medical Sciences.